Abstract: Peripheral nerve injury is an important clinical problem that can exert hazardous effects on the health of patients. For this reason, there are more studies conducted on the regeneration of the peripheral nerves via the usage of the nerves belonging to various animals with different types of lesions, ages, and by using different methods of assessment with regular follow-up. Contrary to data obtained through experimentation and clinical observation, no ideal way of treatment was found to increase the regeneration of the peripheral nerves. Finally, the effects of melatonin in the protection of peripheral nerves against trauma, especially the protection of sciatic nerve from pathological conditions, have come into attention in a wide group of scientists as there are beneficial effects of melatonin after surgery. While numerous studies indicate the melatonin’s protective effects on the pathologies of nerves, there are also studies reporting its toxic effects on peripheral nerves. 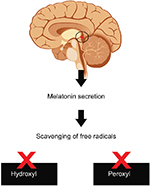 Melatonin is a widespread and crucial signaling molecule due to its features of free radical scavenging and anti-oxidation at both pharmacological and physiological conditions in vivo. In this context, although there are numerous studies elaborating the effects of melatonin in various tissues, its effects on peripheral nerves was documented in only a limited number of studies. The aim of this article was to perform a review of the knowledge in the literature on the subject of mostly beneficial or hazardous effects of melatonin on the repair of the damaged peripheral nerves. What do we know about the peripheral nerve injury? Current treatment modalities for peripheral nerve injuries are autologous nerve transplantation from sural, saphenous, or medial cutaneous nerves.7 It has been reported that the autologous nerve transplantation has fully recovered sensory restorations, whereas motor functions are recovered at a maximum of 40% level. Complications related to autograft include loss of function (motor and/or sensory), insufficient donor nerve tissue, and donor site morbidity.8,9 It is important to understand how nerve tissue repairs itself spontaneously, partly, to develop a repair strategy for greater damage. First studies on peripheral nerve damage are based on the experiments conducted by Augustus Waller in 1850 on the glossopharyngeal and hypoglossal nerves of frogs. Waller tried to observe the postdamage events on axons and tried to explain in his own words that a great number of small chambers were formed on the distal part of the peripheral nerve and Schwann cells lost their white substance (myelin sheaths).10 In this century, this process that we call “Wallerian degeneration” corresponds to inflammatory response that occurs in the peripheral nerve as a result of rupture or damage. A great number of genes and proteins (neurotrophic factors, cytokines, and cell adhesion molecules) take charge in all stages of Wallerian degeneration in a coordinated way.11,12 The inflammatory process after the peripheral nerve damage influences nerve repair in a positive way. Immunocytochemical analyses have confirmed that after the sciatic nerve damage, T cells and macrophages migrate to the damage area in 2 days and they expand to the distal part in 4 days.11–15 First, Wallerian degeneration starts with the destruction and degeneration of axoplasm and axolemma, and it is completed within 24 hours in small nerves and within 48 hours in greater nerves. After damage, intracellular and extracellular calcium concentration increase directly proportionally with the severity of damage.16,17 In in vitro study, increased calcium concentration has been shown to be a significant suppressive factor for the survival of Schwann cells.18 Axon destruction that starts with the flow of axonal protease and calcium continues with the help of various intrinsic factors. Results of studies conducted in our laboratory show the remarkable decrease in myelin sheath thickness of axons and axon diameter (Figure 1). Figure 1 The light micrograph shows the Toluidine blue staining of the rat sciatic nerve in 500-nm resin-embedded sections. Notes: (A) Normal peripheral nerve view with tightly packed nerves in normal axon diameter. (B) The view of the crushed nerve 30 days after injury. Abundant number of newly formed and small axons is observed in response to nerve damage. Wallerian degeneration and macrophage-mediated phagocytosis stages have been completed and nerve self-repair initiated. Arrow, myelinated axon; arrowhead, Schwann cell; asterisk, in some of the nerves, the myelin appears to consist of two separate rings. This is caused by the section passing through a Schmidt–Lanterman cleft. In electron microscopic sections, newly formed myelinated and unmyelinated axons are noted in damaged nerves (Figure 2). Figure 2 The electron microscopic micrograph indicates the sciatic nerve distal to the nerve crush site from a crush-injured rat. Notes: (A) Normal peripheral nerve. (B) The view of the crushed nerve 30 days after injury. Sections were stained with lead citrate and uranyl acetate. Arrow, myelinated axon; arrowhead, unmyelinated axon; asterisk, newly formed myelinated axons. Bar indicates 1 mm length. Knowing the order of the events that take place after damage and the effect mechanisms of the factors in charge and thus understanding Wallerian degeneration are important for clarifying the most suitable treatment methods. Several studies showed that melatonin supplement decrease the scar formation in the nerve injury through inhibiting the collagen production.73,78,81,84 Similarly, Shokouhi et al85 reported that low-dose melatonin supplement could decrease the myelin damage and axonal alterations in the peripheral nerve. In addition, Stavisky et al86 pointed out that melatonin also plays a major role in the healing of a highly injured sciatic nerve by plasmalemma fusion. While studies on the effect of melatonin on the regeneration often deal with oxidative stress mechanisms, the effects of melatonin can be elaborated with molecular researches. Figure 3 The schema represents the receptor-dependent and receptor-independent effects of melatonin. Notes: This figure shows the effect of melatonin and its metabolites on scavenging the reactive oxygen products through nonreceptor-independent actions. Abbreviations: MT1, metallothionein 1; SOD, superoxide dismutase. Figure 4 Melatonin is an endogenously synthesized and secreted hormone by the pineal gland and possesses intense antioxidant activity. Figure 5 Schematic representation shows the role of NF-kB and Nrf2 pathways on the effect of melatonin on the injury. Notes: Melatonin induces the antioxidant protection. ROS increases the NF-kB transcription and cytokines. In addition, relationship between inflammation and lipid peroxidation is explained in the schema and the role of them on apoptosis. Abbreviations: IL, interleukin; NF-kB, nuclear factor-κB; Nrf2, nuclear factor 2; ROS, reactive oxygen species; TNF, tumor necrosis factor; ICAM, intercellular adhesion molecule; SOD, superoxide dismutase; GST, glutathione S-transferase. After injury, a number of endogenous factors have been identified that are effective in maintaining the vitality of axons and axonal growth.109,110 Schwann cells play a key role in peripheral nerve regeneration by regulating axonal proliferation.111 In addition, Schwann cells secrete various neurotrophic factors such as bFGF and nerve growth factor, which play a major role in regeneration of peripheral nervous system and development.112,113 In addition, bGFG and TGF-β are important for Schwann cell activity. Turgut et al114 studied the expression of these growth factors, which have important role in the control of neuroma formation and collagen accumulation in rats that underwent pinealectomy. Also this study showed that melatonin supplementation suppressed proximal neuroma and contributed to repair mechanism. 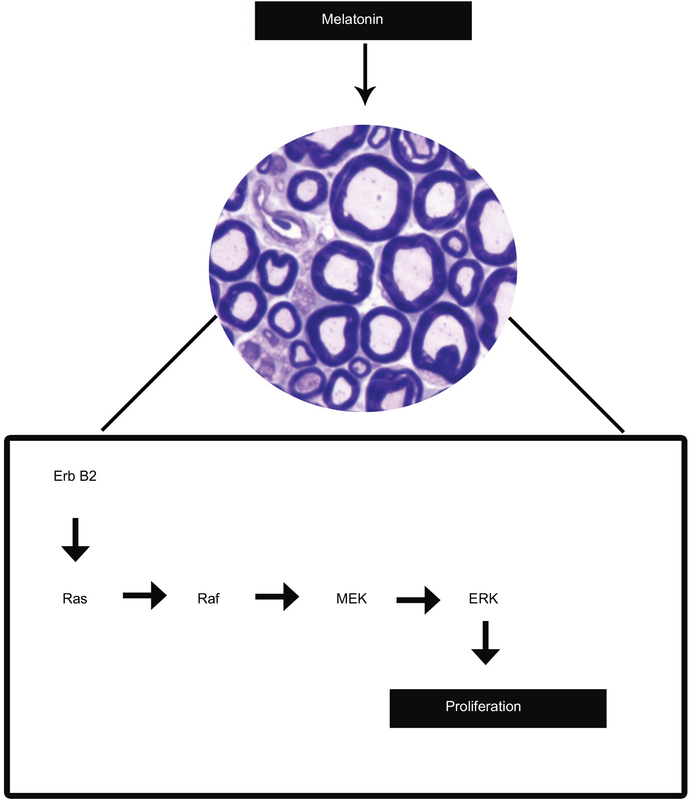 Figure 6 Schematic representation indicates the role of ErbB2 receptor on inducing the Schwann cell proliferation through Ras/Raf/MEK/ERK pathway. Abbreviations: ERK, extracellular signal-regulated kinase; MEK, mitogen-activated protein kinase. After trauma, an increase in lipid peroxidation occurs. Significant increases in lipid peroxidation have been shown at 1st, 24th, and 48th hours in studies performed.122 It was determined that the rate of peroxidation returned to its preinjury level, and melatonin had maximal chronic neuroprotective effect after 48 hours.123 In addition, it was suggested that melatonin is neuroprotective at doses of 1–50 mg/kg.85,114,122 Especially, Shokouhi et al85 reported that melatonin at 50 mg/kg dose has a potentially positive effect on preserving the neural fibers. Similarly, Kaya et al124,125 studied the effect of melatonin at 50 mg/kg dose on nerve injury. In clinical studies, melatonin doses range from 0.1 to 2,000 mg.92 More than 0.5 mg of melatonin dosage shows pharmacologically therapeutic effect.126,127 Rogerio et al128 investigated the effect of melatonin on motor neuron death in the spinal cord after sciatic nerve injury in their study and compared the doses of 1, 5, 10, and 50 mg/kg of melatonin for this purpose. They reported that 1–50 mg/kg melatonin is effective in decreasing the neuronal death. In addition, the neuroprotective effect is fully active even at the lowest dose, although toxic effects may possibly occur at doses of 50–100 mg/kg.128 In addition, Cunnane et al129 previously studied low doses (30 µg/100 g) of melatonin after the pinealectomy process. They reported that melatonin reduced the collagen in the injury area.129 However; Atik et al92 suggested that the physiological dose of melatonin could not be sufficient for its beneficial effects. Melatonin shows the receptor-mediated activity at physiological doses. However, pharmacological concentrations of melatonin are required for the receptor-independent activity.130 Turgut et al131 reported the positive effect of melatonin on reducing the neuroma formation in the sciatic nerve injury by enhancing axonal regeneration. Shokouhi et al85 compared the effects of low (10 mg/kg) and high dose (50 mg/kg) of melatonin on lipid peroxidation in the experimental sciatic nerve injury. In this study, they aimed to assess the dose-dependent neuroprotective and antioxidant activity of melatonin on injury. They found the beneficial effects of high-dose melatonin on axonal damage compared to that of low-dose melatonin.85 Contrarily, Gul et al132 reported no dose-dependent effect of melatonin in the decreasing of lipid peroxidation in the sciatic nerve-injured rat after spinal cord clamping. Rogerio et al128 investigated the effect of melatonin at doses of 1, 5, 10, and 50 mg/kg on sciatic nerve injury and observed the significant decrease in motor neuron death in the melatonin-treated groups. According to this study, administration of the low dose of melatonin is more effective for the neuronal survival rather than a high concentration of melatonin.128 At this point, it can be said that the high dose of melatonin causes the toxic effect. Another study conducted by Chang et al100 suggested that melatonin decreased the expression of NO synthase in the hypoglossal nerve injury and a dose-dependent neuroprotective effect of it is due to antioxidant properties. It is important to determine the minimum dose of melatonin in peripheral nerve regeneration. Ulugol et al133 demonstrated that high dose of melatonin prevented thermal hyperalgesia caused by nerve damage. In mice, intracerebroventricular and intraperitoneal administration of melatonin prevented the hyperalgesia by L-arginine–NO and opioidergic pathways in the neuropathic pain. However, it had no effect on the mechanical allodynia.133 Opioidergic and gamma-aminobutyric acid ergic systems have an important role in the effects of melatonin.134,135 Similarly, Mantovani et al135 showed the antidepressant effect of melatonin in the mouse through L-arginine–NO pathway and N-methyl D-aspartate receptors. Also it can be concluded that useful doses of melatonin contribute to the repair of peripheral nerve injury by attenuating the oxidative stress mechanisms. Stavisky et al86 investigated the effects of cyclosporine A, glial-derived neurotrophic factor, and methylprednisolone, as well as the effects of melatonin on polyethylene glycol-induced repair in the sciatic damage. They measured conduction of compound action potentials in the lesion area after polyethylene glycol fusion. In in vivo and in vitro preparations, a significant increase in the improvement for melatonin-administrated group was determined compared to control Krebs saline. They suggested that in combination with polyethylene glycol fusion, melatonin provides rapid repair of crush-type injuries of the spinal cord.86 Similarly, Daglioglu et al137 designed a study on beneficial effects of melatonin at appropriate doses on peripheral nerve injury. They suggested that melatonin administration could be successful in the treatment of peripheral nerve injury.137 Moreover, Zencirci et al138 examined the functional effects of melatonin on sciatic nerve crush injury. The researchers applied melatonin at doses of 5 and 20 mg/kg for 21 days. In this study, melatonin showed a positive effect on the sciatic function index. In addition, while melatonin increases the conduction velocities, it decreases latency according to the study by Zencirci et al,138 and the regenerative effect of the melatonin has been shown to be dose independent. Possibly the application of melatonin at 5 and 20 mg/kg intraperitoneally may show similar antioxidant effect.138 However, Atik et al92 suggested that beneficial effects of melatonin in nerve regeneration could be seen at physiological doses. Kaplan et al83 studied the effects of intraperitoneal melatonin administration after intraoperative platelet gel on sciatic nerve regeneration. Platelet gel application had a positive effect on nerve regeneration, but platelet gel application did not show the same effect when combined with melatonin. Administration of melatonin alone or in combination with platelet gel did not show any positive effect on nerve regeneration. This failure of regeneration reveals that melatonin does not play a role in inhibiting collagen formation.83 In other respects, 30 µg/100 g melatonin was used in this study.81 This dose may be inadequate to show antioxidant activity of melatonin. However, Kaya et al71 suggested that administration of 50 mg/kg melatonin showed improvement effects on nerve injury reducing oxidative stress. As a result, studies in recent years have focused on introducing new methods, including the local application of antioxidants, rather than the systemic application of them to accelerate the regeneration process in nerve crush injury. Peripheral nerve injuries are still among the vital clinical issues, and thus, the research for advanced knowledge about this condition and its treatment still continues.92 Regarding this, some studies demonstrate that pineal neurohormone melatonin has effects on the physiological and histological properties of the nerve tissue, hinting at its effects of antioxidation, analgesia, and free radical scavenging in the degenerative peripheral nerve disorders. It is acknowledged that melatonin has beneficial effects on the length of the axons, the sprouting after the damage to peripheral nerves.93,96,140 Nevertheless, some studies indicate the hazardous effects of melatonin on peripheral nerves.141,142 To shed light on the beneficial or detrimental effects of melatonin treatment in low and high doses, further clinical and experimental studies should be performed. 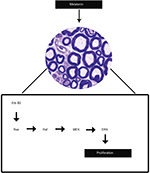 Hasegawa T, Kuroda M. A new role of uric acid as an antioxidant in human plasma. Rinsho Byori. 1989;37(9):1020–1027. Grogan BF, Hsu JR. Volumetric muscle loss. J Am Acad Orthop Surg. 2011;19(1):35–37. Grasman JM, Zayas MJ, Page RL, Pins GD. Biomimetic scaffolds for regeneration of volumetric muscle loss in skeletal muscle injuries. Acta Biomater. 2015;25:2–15. Dagum AB. Peripheral nerve regeneration, repair, and grafting. J Hand Ther. 1998;11(2):111–117. Sunderland S. A classification of peripheral nerve injuries producing loss of function. Brain. 1951;74(4):491–516. Seddon HJ. Three types of nerve injuries. Brain. 1943;66(4):237–288. Ichihara S, Inada Y, Nakamura T. Artificial nerve tubes and their application for repair of peripheral nerve injury: an update of current concepts. Injury. 2008;39(4):29–39. Allodi I, Udina E, Navarro X. Specificity of peripheral nerve regeneration: interactions at the axon level. Prog Neurobiol. 2012;98(1):16–37. Sivak WN, White JD, Bliley JM, et al. Delivery of chondroitinase ABC and glial cell line-derived neurotrophic factor from silk fibroin conduits enhances peripheral nerve regeneration. J Tissue Eng Regen Med. 2014;11(3):733–742. Waller A. Experiments on the section of the glossopharyngeal and hypoglossal nerves of the frog, and observations of the alterations produced thereby in the structure of their primitive fibres. Philos Trans R Soc Lond. 1850;140:423–429. Rotshenker S, Aamar S, Barak V. Interleukin-1 activity inlesioned peripheral nerve. J Neuroimmunol. 1992;39(1–2):75–80. Reicherd F, Rotshenker S. Deficient activation of microglia during optic nerve regeneration. J Neuroimmunol. 1996;70:153–161. Brück W. The role of macrophages in Wallerian degeneration. Brain Pathol. 1997;7(2):741–752. Stoll G, Jander S. The role of the microglia and macrophages in the pathophysiology of the CNS. Prog Neurobiol. 1999;58(3):233–247. Jander S, Pohl J, Gillen C, Stoll G. Differential expression of interleukin-10 Mrna in Wallerian degeneration and immune mediated inflamation of the rat peripheral nervous system. J Neurosci Res. 1996;43(2):254–259. LoPachin RM, Lehning EJ. Mechanism of calcium entry during axon injury and degeneration. Toxicol Appl Pharmacol. 1997;143(2):233–244. Manev H, Favaron M, Guidotti A, Costa E. Delayed increase of Ca2þ influx elicited by glutamate: role in neuronal death. Mol Pharmacol. 1989;36(1):106–112. Yang KJ, Yan Y, Zhang LL, et al. Increasing calcium level limits Schwann cell numbers in vitro following peripheral nerve injury. J Reconstr Microsurg. 2017;33(6):435–440. Perry VH, Brown MC, Lunn ER, Tree P, Gordon S. Evidence that very slow Wallerian degeneration in C57BL/Ola mice is an intrinsic property of the peripheral nerve. Eur J Neurosci. 1990;2(9):802–808. Glass JD, Brushart TM, George EB, Griffin JW. Prolonged survival of transsected nerve fibres in C57BL/Ola mice is an intrinsic characteristic of the axon. J Neurocytol. 1993;22(5):311–321. Bolin LM, Verity AN, Silver JE, Shooter EM, Abrams JS. Interleukin-6 production by schwann cells and induction in sciatic nerve injury. J Neurochem. 1995;64(2):850–858. Bourde O, Kiefer R, Toyka KV, Hartung HP. Quantification of interleukin 6 Mrna in Wallerian degeneration by competititve reverse transcription polymerase chain reaction. J Neuroimmunol. 1996;69(1–2):135–140. Lin SF, Chien JY, Kapupara K, Huang CF, Huang SP. Oroxylin A promotes retinal ganglion cell survival in a rat optic nerve crush model. PLoS One. 2017;12(6):e0178584. Lunn ER, Perry VH, Brown MC, Rosen H, Gordon S. Absence of Wallerian degeneration does not hinder regeneration in peripheral nerve. Eur J Neurosci. 1989;1(1):27–33. Beirowski B, Adalbert R, Wagner D, et al. The progressive nature of Wallerian degeneration in wild-type and slow Wallerian degeneration (WldS) nerves. BMC Neurosci. 2005;6:6. Gilley J, Coleman MP. Endogenous NMNAT2 is an essential survival factor for maintenance of healthy axons. PLoS Biol. 2010;8(1):e1000300. Osterloh JM, Yang J, Rooney TM, et al. dSarm/Sarm1 is required for activation of an injury-induced axon death pathway. Science. 2012;337(6093):481–484. Gerdts J, Summers DW, Sasaki Y, DiAntonio A, Milbrandt J. Sarm1-mediated axon degeneration requires both SAM and TIR interactions. J Neurosci. 2013;33(33):13569–13580. Lauria G, Lombardi R. Skin biopsy: a new tool for diagnosing peripheral neuropathy. BMJ. 2007;334(7604):1159–1162. Conforti L, Gilley J, Coleman MP. Wallerian degeneration: an emerging axon death pathway linking injury and disease. Nat Rev Neurosci. 2014;15(6):394–409. Perrin FE, Lacroix S, Aviles-Trigueros M, David S. Involvement of monocyte chemoattractant protein-1, macrophage inflammatory protein-1alpha and interleukin-1beta in Wallerian degeneration. Brain. 2005;128(pt 4):854–866. Boivin A, Pineau I, Barrette B, et al. Toll-like receptor signalling is critical for Wallerian degeneration and functional recovery after peripheral nerve injury. J Neurosci. 2017;27(46):12565–12576. Chen ZL, Yu WM, Strickland S. Peripheral regeneration. Annu Rev Neurosci. 2007;30:209–233. Vargas ME, Barres BA. Why is Wallerian degeneration in the CNS so slow? Annu Rev Neurosci. 2007;30:153–179. Camara-Lemarroy CR, Guzman-de la Garza FJ, Fernandez-Garza NE. Molecular inflammatory mediators in peripheral nerve degeneration and regeneration. Neuroimmunomodulation. 2010;17(5):314–324. Napoli I, Noon LA, Ribeiro S, et al. A central role for ERK-signalling pathway in controlling Schwan cell plasticity and peripheral nevre regeneration in vivo. Neuron. 2012;73(4):729–742. Menorca RM, Fussell TS, Elfar JC. Nerve physiology: mechanisms of injury and recovery. Hand Clin. 2013;29(3):317–330. Bastien D, Lacroix S. Cytokine pathways regulating glial and leukocyte function after spinal cord and peripheral nerve injury. Exp Neurol. 2014;258:62–77. Brosius LA, Barres BA. Contrasting the glial response to axon injury in the central and peripheral nervous systems. Dev Cell. 2014;28(1):7–17. Mietto BS, Mostacada K, Martinez AM. Neurotrauma and inflammation: CNS and PNS responses. Mediators Inflamm. 2015;2015:251204. Reiter RJ. The pineal gland and melatonin in relation to aging: a summary of the theories and of the data. Exp Gerontol. 1995;30(3–4):199–212. Rodriguez C, Mayo JC, Sainz RM, et al. Regulation of antioxidant enzymes: a significant role for melatonin. J Pineal Res. 2004;36(1):1–9. Uyanikgil Y, Baka M, Ateş U, et al. Neuroprotective effects of melatonin upon the offspring cerebellar cortex in the rat model of BCNU-induced cortical dysplasia. Brain Res. 2007;1160:134–144. Axelrod J, Wurtman RJ. Photic and neural control of indoleamine metabolism in the rat pineal gland. Adv Pharmacol. 1968;6(pt A):157–166. Claustrat B, Brun J, Chazot G. The basic physiology and pathophysiology of melatonin. Sleep Med Rev. 2005;9(1):11–24. Skene DJ, Papagiannidou E, Hashemi E, et al. Contribution of CYP1A2 in the hepatic metabolism of melatonin: studies with isolated microsomal preparations and liver slices. J Pineal Res. 2001;31(4):333–342. Hirata F. Melatonin. No Shinkei Geka. 1974;2(3):207–212. Hardeland R, Reiter RJ, Poeggeler B, Tan DX. The significance of the metabolism of the neurohormone melatonin: antioxidative protection and formation of bioactive substances. Neurosci Biobehav Rev. 1993;17(3):347–357. Tan DX, Manchester LC, Terron MP, Flores LJ, Reiter RJ. One molecule, many derivatives: a never-ending interaction of melatonin with reactive oxygen and nitrogen species? J Pineal Res. 2007;42(1):28–42. Cassone VM. 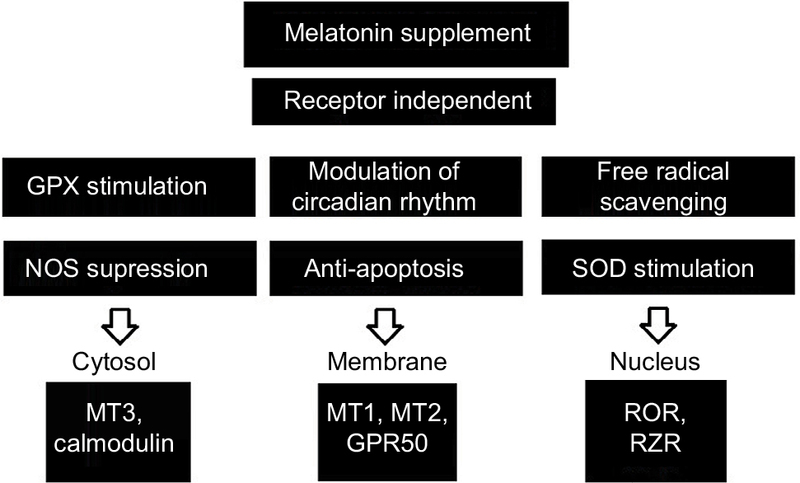 Effects of melatonin on vertebrate circadian systems. Trends Neurosci. 1990;13(11):457–464. Blask DE, Hill SM, Orstead KM, Massa JS. Inhibitory effects of the pineal hormone melatonin and underfeeding during the promotional phase of 7,12 dimethylbenzanthracene-(DMBA)-induced mammary tumorigenesis. J Neural Transm. 1986;67(1–2):125–138. Maestroni GJ, Conti A, Pierpaoli W. Role of the pineal gland in immunity: II. Melatonin enhances the antibody response via an opiatergic mechanism. Clin Exp Immunol. 1987;68(2):384–391. Tan DX, Chen LD, Poeggeler B, et al. Melatonin: a potent endogenous hydroxyl radical scavenger. Endocr J. 1993;1:57–60. Steinhilber D, Brungs M, Werz O, et al. The nuclear receptor for melatonin repress 5-lipoxygenase gene expression in human B lymphocytes. J Biol Chem. 1995;270(13):7037–7040. Reiter RJ. Oxidative processes and antioxidative defense mechanisms in the aging brain. FASEB J. 1995;9(7):526–533. Reiter RJ. Oxidative damage in the central nervous system: protection by melatonin. Prog Neurobiol. 1998;56(3):359–384. Reiter RJ, Maestroni G. Melatonin in relation to the antioxidative defense and immune systems: possible implications for cell and organ transplantation. J Mol Med. 1999;77(1):36–39. Karbownik M, Reiter RJ. Antioxidative effects of melatonin in protection against cellular damage caused by ionizing radiation. Proc Soc Exp Biol Med. 2000;225(1):9–22. Reiter RJ, Tan DX. Melatonin: a novel protective agent against oxidative injury of the ischemic/reperfused heart. Cardiovasc Res. 2003;58(1):10–19. Allegra M, Reiter RJ, Tan DX, Gentile C, Tesoriere L, Livrea MA. The chemistry of melatonin’s interaction with reactive species. J Pineal Res. 2003;34(1):1–10. Tan DX, Manchester LC, Sanchez-Barcelo E, Mediavilla MD, Reiter RJ. Significance of high levels of endogenous melatonin in Mammalian cerebrospinal fluid and in the central nervous system. Curr Neuropharmacol. 2010;8(3):162–167. Tan DX, Manchester LC, Liu X, Rosales-Corral SA, Acuna-Castroviejo D, Reiter RJ. Mitochondria and chloroplasts as the original sites of melatonin synthesis: a hypothesis related to melatonin’s primary function and evolution in eukaryotes. J Pineal Res. 2013;54(2):127–138. Qiu T, Yin Y, Li B. PDLLA/PRGD/beta-TCP conduits build the neurotrophin-rich microenvironment suppressing the oxidative stress and promoting the sciatic nerve regeneration. J Biomed Mater Res A. 2014;102(10):3734–3743. Menovsky T, Beek JF. Laser, fibrin glue, or suture repair of peripheral nerves: a comparative functional, histological, and morphometric study in the rat sciatic nerve. J Neurosurg. 2001;95(4):694–699. Pichichero M, Beer B, Clody DE. Effects of dibutyryl cyclic AMP on restoration of function of damaged sciatic nerve in rats. Science. 1973;182(4113):724–725. Cockett SA, Kiernan JA. Acceleration of peripheral nervous regeneration in the rat by exogenous triiodothyronine. Exp Neurol. 1973;39(3):389–394. Roisen FJ, Murphy RA, Pichichero ME, Braden WG. Cyclic adenosine monophosphate stimulation of axonal elongation. Science. 1972;175(4017):73–74. Behram Kandemir Y, Sarikcioglu L. Melatonin and its therapeutic actions on peripheral nerve regeneration. Folia Morphol (Warsz). 2015;74(3):283–289. Kaya Y, Savas K, Sarikcioglu L, Yaras N, Angelov DN. Melatonin leads to axonal regeneration, reduction in oxidative stress, and improved functional recovery following sciatic nerve injury. Curr Neurovasc Res. 2015;12(1):53–62. Keskin I, Kaplan S, Kalkan S, Sutcu M, Ulkay MB, Esener OB. Evaluation of neuroprotection by melatonin against adverse effects of prenatal exposure to a nonsteroidal anti-inflammatory drug during peripheral nerve development. Int J Dev Neurosci. 2015;41:1–7. Yanilmaz M, Akduman D, Sagun OF, et al. The effects of aminoguanidine, methylprednisolone, and melatonin on nerve recovery in peripheral facial nerve neurorrhaphy. J Craniofac Surg. 2015;26(3):667–672. Matsuyama T, Mackay M, Midha R. Peripheral nerve repair and grafting techniques: a review. Neurol Med Chir (Tokyo). 2000;40(4):187–199. Mekaj AY, Morina AA, Bytyqi CI, Mekaj YH, Duci SB. Application of topical pharmacological agents at the site of peripheral nerve injury and methods used for evaluating the success of the regenerative process. J Orthop Surg Res. 2014;9:94. Onger ME, Kaplan S, Deniz OG, et al. Possible promoting effects of melatonin, leptin and alcar on regeneration of the sciatic nerve. J Chem Neuroanat. 2017;81:34–41. Onger ME, Kaplan S, Geuna S. Possible effects of some agents on the injured nerve in obese rats: a stereological and electron microscopic study. J Craniomaxillofac Surg. 2017;45(8):1258–1267. Altun A, Ugur-Altun B. Melatonin: therapeutic and clinical utilization. Int J Clin Pract. 2007;61(5):835–845. Reiter RJ, Tan DX, Leon J, Kilic U, Kilic E. When melatonin gets on your nerves: its beneficial actions in experimental models of stroke. Exp Biol Med (Maywood). 2005;230(2):104–117. Sahna E, Acet A, Ozer MK, Olmez E. Myocardial ischemia-reperfusion in rats: reduction of infarct size by either supplemental physiological or pharmacological doses of melatonin. J Pineal Res. 2002;33(4):234–238. Turgut M, Uysal A, Pehlivan M, Oktem G, Yurtseven ME. Assessment of effects of pinealectomy and exogenous melatonin administration on rat sciatic nerve suture repair: an electrophysiological, electron microscopic, and immunohistochemical study. Acta Neurochir (Wien). 2005;147(1):67–77. Davison SP, McCaffrey TV, Porter MN, Manders E. Improved nerve regeneration with neutralization of transforming growth factor-beta1. Laryngoscope. 1999;109(4):631–635. Kaplan S, Piskin A, Ayyildiz M, et al. The effect of melatonin and platelet gel on sciatic nerve repair: an electrophysiological and stereological study. Microsurgery. 2011;31(4):306–313. Drobnik J, Dabrowski R. Melatonin suppresses the pinealectomy-induced elevation of collagen content in a wound. Cytobios. 1996;85(340):51–58. Shokouhi G, Tubbs RS, Shoja MM, et al. Neuroprotective effects of high-dose vs low-dose melatonin after blunt sciatic nerve injury. Childs Nerv Syst. 2008;24(1):111–117. Stavisky RC, Britt JM, Zuzek A, Truong E, Bittner GD. Melatonin enhances the in vitro and in vivo repair of severed rat sciatic axons. Neurosci Lett. 2005;376(2):98–101. Khalil Z, Khodr B. A role for free radicals and nitric oxide in delayed recovery in aged rats with chronic constriction nerve injury. Free Radic Biol Med. 2001;31(4):430–439. Naik AK, Tandan SK, Dudhgaonkar SP, et al. Role of oxidative stress in pathophysiology of peripheral neuropathy and modulation by N-acetyl-L-cysteine in rats. Eur J Pain. 2006;10(7):573–579. Kong X, Li X, Cai Z, et al. Melatonin regulates the viability and differentiation of rat midbrain neural stem cells. Cell Mol Neurobiol. 2008;28(4):569–579. Odaci E, Kaplan S. Chapter 16: melatonin and nerve regeneration. Int Rev Neurobiol. 2009;87:317–335. Huerto-Delgadillo L, Anton-Tay F, Benitez-King G. Effects of melatonin on microtubule assembly depend on hormone concentration: role of melatonin as a calmodulin antagonist. J Pineal Res. 1994;17(2):55–62. Atik B, Erkutlu I, Tercan M, Buyukhatipoglu H, Bekerecioglu M, Pence S. The effects of exogenous melatonin on peripheral nerve regeneration and collagen formation in rats. J Surg Res. 2011;166(2):330–336. Turgut M, Kaplan S. Effects of melatonin on peripheral nerve regeneration. Recent Pat Endocr Metab Immune Drug Discov. 2011;5(2):100–108. Chang HM, Huang YL, Lan CT, Wu UI, Hu ME, Youn SC. Melatonin preserves superoxide dismutase activity in hypoglossal motoneurons of adult rats following peripheral nerve injury. J Pineal Res. 2008;44(2):172–180. El-Abhar HS, Shaalan M, Barakat M, El-Denshary ES. Effect of melatonin and nifedipine on some antioxidant enzymes and different energy fuels in the blood and brain of global ischemic rats. J Pineal Res. 2002;33(2):87–94. Sayan H, Ozacmak VH, Ozen OA, et al. Beneficial effects of melatonin on reperfusion injury in rat sciatic nerve. J Pineal Res. 2004;37(3):143–148. Okatani Y, Wakatsuki A, Kaneda C. Melatonin increases activities of glutathione peroxidase and superoxide dismutase in fetal rat brain. J Pineal Res. 2000;28(2):89–96. Reiter RJ, Acuna-Castroviejo D, Tan DX, Burkhardt S. Free radical-mediated molecular damage. Mechanisms for the protective actions of melatonin in the central nervous system. Ann N Y Acad Sci. 2001;939:200–215. Reiter RJ, Tan DX, Galano A. Melatonin: exceeding expectations. Physiology (Bethesda). 2014;29(5):325–333. Chang HM, Ling EA, Lue JH, Wen CY, Shieh JY. Melatonin attenuates neuronal NADPH-d/NOS expression in the hypoglossal nucleus of adult rats following peripheral nerve injury. Brain Res. 2000;873(2):243–251. Reiter R, Tang L, Garcia JJ, Munoz-Hoyos A. Pharmacological actions of melatonin in oxygen radical pathophysiology. Life Sci. 1997;60(25):2255–2271. Galindo Moreno P, Avila Ortiz G, Wang HL, Padial Molina M, Ortega Oller I, O’Valle F. The role of melatonin in periodontal and periimplant bone homeostasis and regeneration. J Oral Sci Rehabil. 2016;2(2):8–15. Mauriz JL, Collado PS, Veneroso C, Reiter RJ, Gonzalez-Gallego J. A review of the molecular aspects of melatonin’s anti-inflammatory actions: recent insights and new perspectives. J Pineal Res. 2013;54(1):1–14. Manchester LC, Coto-Montes A, Boga JA, et al. Melatonin: an ancient molecule that makes oxygen metabolically tolerable. J Pineal Res. 2015;59(4):403–419. Reiter RJ, Mayo JC, Tan DX, Sainz RM, Alatorre-Jimenez M, Qin L. Melatonin as an antioxidant: under promises but over delivers. J Pineal Res. 2016;61(3):253–278. Bekyarova G, Tzaneva M. Melatonin ameliorates burn-induced liver injury by modulation of Nrf2 and Nf-kB signalling pathways. SOJ Immunol. 2015;3(2):1–8. Ianăş O, Olinescu R, Bădescu I. Melatonin involvement in oxidative processes. Endocrinologie. 1991;29(3–4):147–153. Reiter RJ. Interactions of the pineal hormone melatonin with oxygen-centered freeradicals: a brief review. Braz J Med Biol Res. 1993;26(11):1141–1155. Lundborg G. A 25-year perspective of peripheral nerve surgery: evolving neuroscientific concepts and clinical significance. J Hand Surg Am. 2000;25(3):391–414. Terenghi G. Peripheral nerve regeneration and neurotrophic factors. J Anat. 1999;194(pt 1):1–14. Webber CA, Christie KJ, Cheng C, et al. Schwann cells direct peripheral nerve regeneration through the Netrin-1 receptors, DCC and Unc5H2. Glia. 2011;59(10):1503–1517. Carey DJ, Bunge RP. Factors influencing the release of proteins by cultured Schwann cells. J Cell Biol. 1981;91(3 pt 1):666–672. Fansa H, Dodic T, Wolf G, Schneider W, Keilhoff G. Tissue engineering of peripheral nerves: epineurial grafts with application of cultured Schwann cells. Microsurgery. 2003;23(1):72–77. Turgut M, Oktem G, Uysal A, Yurtseven ME. Immunohistochemical profile of transforming growth factor-beta1 and basic fibroblast growth factor in sciatic nerve anastomosis following pinealectomy and exogenous melatonin administration in rats. J Clin Neurosci. 2006;13(7):753–758. Chang HM, Liu CH, Hsu WM, et al. Proliferative effects of melatonin on Schwann cells: implication for nerve regeneration following peripheral nerve injury. J Pineal Res. 2014;56(3):322–332. Ogata T, Yamamoto S, Nakamura K, Tanaka S. Signalling axis in schwann cell proliferation and differentiation. Mol Neurobiol. 2006;33(1):51–62. Noon LA, Lloyd AC. Treating leprosy: an Erb-al remedy? Trends Pharmacol Sci. 2007;28(3):103–105. Harrisingh MC, Perez-Nadales E, Parkinson DB, Malcolm DS, Mudge AW, Lloyd AC. The Ras/Raf/ERK signalling pathway drives Schwann cell dedifferentiation. EMBO J. 2004;23(15):3061–3071. Syed N, Reddy K, Yang DP, et al. Soluble neuregulin-1 has bifunctional, concentration-dependent effects on Schwann cell myelination. J Neurosci. 2010;30(17):6122–6131. Seo TB, Oh MJ, You BG, et al. ERK1/2-mediated Schwann cell proliferation in the regenerating sciatic nerve by treadmill training. J Neurotrauma. 2009;26(10):1733–1744. Corfas G, Velardez MO, Ko CP, Ratner N, Peles E. Mechanisms and roles of axon-Schwann cell interactions. J Neurosci. 2004;24(42):9250–9260. Hall ED, Braughler JM. Effects of intravenous methylprednisolone on spinal cord lipid peroxidation and (Na+ + K+)-ATPase activity. Dose-response analysis during 1st hour after contusion injury in the cat. J Neurosurg. 1982;57(2):247–253. Genovese T, Mazzon E, Muia C, Bramanti P, De Sarro A, Cuzzocrea S. Attenuation in the evolution of experimental spinal cord trauma by treatment with melatonin. J Pineal Res. 2005;38(3):198–208. Kaya Y, Sarikcioglu L, Aslan M, et al. Comparison of the beneficial effect of melatonin on recovery after cut and crush sciatic nerve injury: a combined study using functional, electrophysiological, biochemical, and electron microscopic analyses. Childs Nerv Syst. 2013;29(3):389–401. 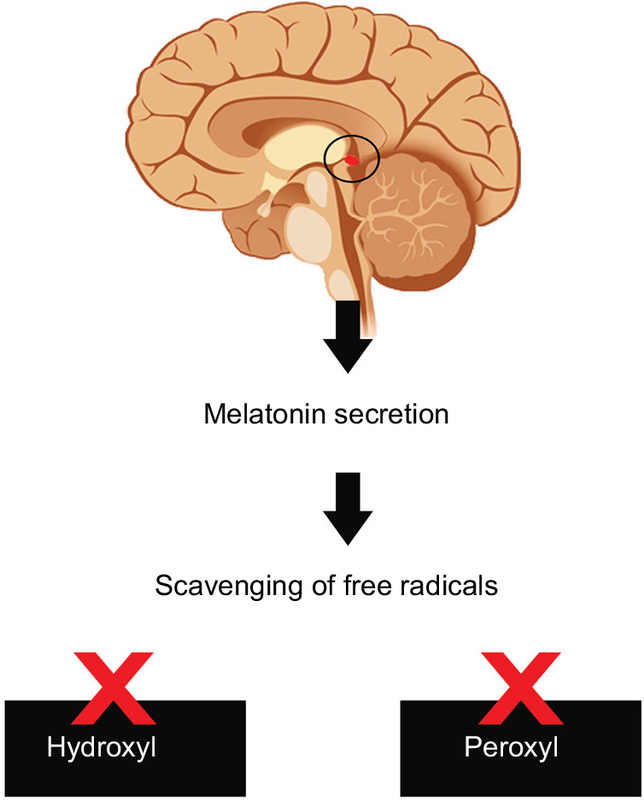 Kaya Y, Sarikcioglu L, Yildirim FB, Aslan M, Demir N. Does circadian rhythm disruption induced by light-at-night has beneficial effect of melatonin on sciatic nerve injury? J Chem Neuroanat. 2013;53:18–24. Iguchi H, Kato KI, Ibayashi H. Melatonin serum levels and metabolic clearance rate in patients with liver cirrhosis. J Clin Endocrinol Metab. 1982;54(5):1025–1027. Sack RL, Lewy AJ, Hughes RJ. Use of melatonin for sleep and circadian rhythm disorders. Ann Med. 1998;30(1):115–121. Rogerio F, de Souza Queiroz L, Teixeira SA, Oliveira AL, de Nucci G, Langone F. Neuroprotective action of melatonin on neonatal rat motoneurons after sciatic nerve transection. Brain Res. 2002;926(1–2):33–41. Cunnane SC, Manku MS, Horrobin DF. The pineal and regulation of fibrosis: pinealectomy as a model of primary biliary cirrhosis: roles of melatonin and prostaglandins in fibrosis and regulation of T lymphocytes. Med Hypotheses. 1979;5(4):403–414. 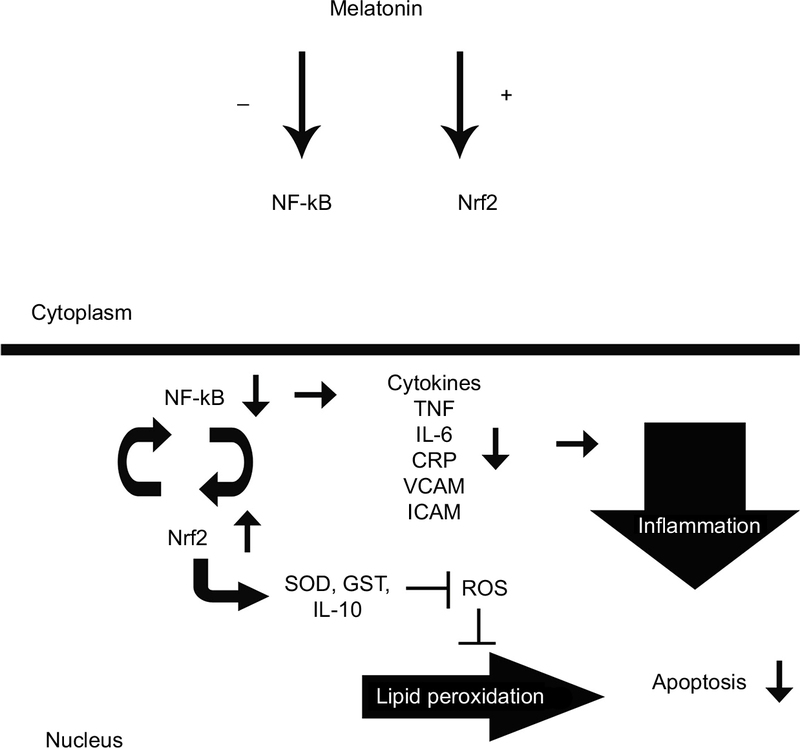 Esposito E, Cuzzocrea S. Antiinflammatory activity of melatonin in central nervous system. Curr Neuropharmacol. 2010;8(3):228–242. Turgut M, Uyanikgil Y, Baka M, et al. Pinealectomy exaggerates and melatonin treatment suppresses neuroma formation of transected sciatic nerve in rats: gross morphological, histological and stereological analysis. J Pineal Res. 2005;38(4):284–291. Gul S, Celik SE, Kalayci M, Tasyurekli M, Cokar N, Bilge T. Dose-dependent neuroprotective effects of melatonin on experimental spinal cord injury in rats. Surg Neurol. 2005;64(4):355–361. Ulugol A, Dokmeci D, Guray G, Sapolyo N, Ozyigit F, Tamer M. Antihyperalgesic, but not antiallodynic, effect of melatonin in nerve-injured neuropathic mice: possible involvements of the L-arginine-NO pathway and opioid system. Life Sci. 2006;78(14):1592–1597. Golombek DA, Escolar E, Burin LJ, De Brito Sanchez MG, Cardinali DP. Time-dependent melatonin analgesia in mice: inhibition by opiate or benzodiazepine antagonism. Eur J Pharmacol. 1991;194(1):25–30. Mantovani M, Pertile R, Calixto JB, Santos AR, Rodrigues AL. Melatonin exerts an antidepressant-like effect in the tail suspension test in mice: evidence for involvement of N-methyl-D-aspartate receptors and the L-arginine-nitric oxide pathway. Neurosci Lett. 2003;343(1):1–4. Turgut M, Kaplan S, Unal BZ, et al. Stereological analysis of sciatic nerve in chickens following neonatal pinealectomy: an experimental study. J Brachial Plex Peripher Nerve Inj. 2010;5:10. Daglioglu E, Serdar Dike M, Kilinc K, et al. Neuroprotective effect of melatonin on experimental peripheral nerve injury: an electron microscopic and biochemical study. Cent Eur Neurosurg. 2009;70(3):109–114. Zencirci SG, Bilgin MD, Yaraneri H. Electrophysiological and theoretical analysis of melatonin in peripheral nerve crush injury. J Neurosci Methods. 2010;191(2):277–282. Salehi M, Naseri-Nosar M, Ebrahimi-Barough S, et al. Polyurethane/gelatin nanofibrils neural guidance conduit containing platelet-rich plasma and melatonin for transplantation of Schwann cells. Cell Mol Neurobiol. 2017:1–11. Reiter RJ, Tan DX, Osuna C, Gitto E. Actions of melatonin in the reduction of oxidative stress. J Biomed Sci. 2000;7(6):444–458. Lehman NL, Johnson LN. Toxic optic neuropathy after concomitant use of melatonin, zoloft, and a high-protein diet. J Neuroophthalmol. 1999;19(4):232–234. Piezzi RS, Cavicchia JC. Effects of cold and melatonin on the microtubules of the toad sciatic nerve. Anat Rec. 1981;200(1):115–120.